Plastic mulch…what can it do for you? Then you can benefit from these mulches. It does the above work for you while you do something else with your time. 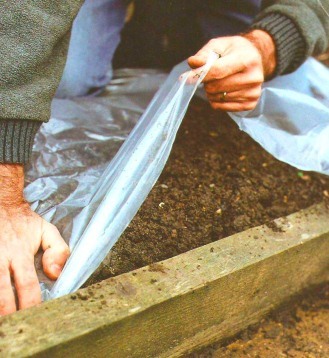 and prevent evaporation (the soil remains moist). They increase production by trapping carbon dioxide. Your crops need carbon dioxide. It is used to generate food (via photosynthesis). This gas builds up under the plastic. 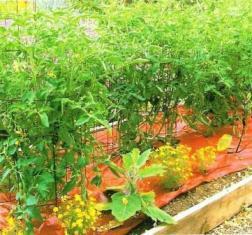 But if you bore tiny holes in the plastic mulch, then the carbon dioxide escapes right under the leaves of vegetables. So the plant has a surplus supply of gas for food. Less fertilizer is lost from the soil. The plastic reduces the flow of water in and out the soil so you’re expensive fertilizers won’t be washed away that easily. And because you grew them earlier…you’ll reap them before the onslaught of pests begins. Straightforward, isn’t it? In some cases the vegetables are harvested a staggering 14 to 21 days earlier than usual. So while your neighbors complain about pest problems you’re crops would have escaped untouched. Infrared transmitting (IRT) mulches which are green in color and allows infrared light to penetrate. They’re superior to black mulches in terms of performance. Red selective reflecting mulches (SMR-Red). These boost production of tomatoes (and also closely related crops like eggplants). They reflect light waves in the red spectrum to increase production. (Studies show increase in yields up to 4 times). If you it’s in your budget, why not hire a landscaper to lay the mulch and drip irrigation system. You can also purchase some wood chippings to cover the plastic. They’re more striking but are also expensive. (Don’t use straw to cover plastic. Straw may still have seeds which can grow into weeds). If your garden is small you can easily install the mulch. But if it’s big more effort is required. But once it’s set up in your vegetable garden, you’ll benefit. You’ll cut down the amount of hours spent in your garden. So give the plastic mulch a try.